The CEO of Hurtigruten says Norway needs a new policy to better manage the numbers of cruise ships. 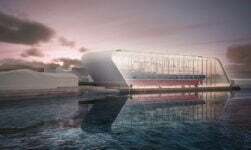 Daniel Skjeldam is concerning about the increasing size of ships visiting small Norwegian towns, the fjords and Svalbard. The boss of cruise and ferry operator Hurtigruten made the comments in an interview with Norwegian newspaper Dagbladet. He blasted the increasing numbers of large cruise ships filling up Norwegian waters and ports. 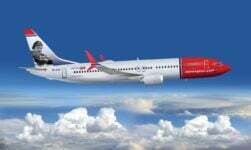 He said he wants to see a complete ban on heavy fuel oil (HFO) all along the Norwegian coastline, and a limit on passenger numbers at some destinations. 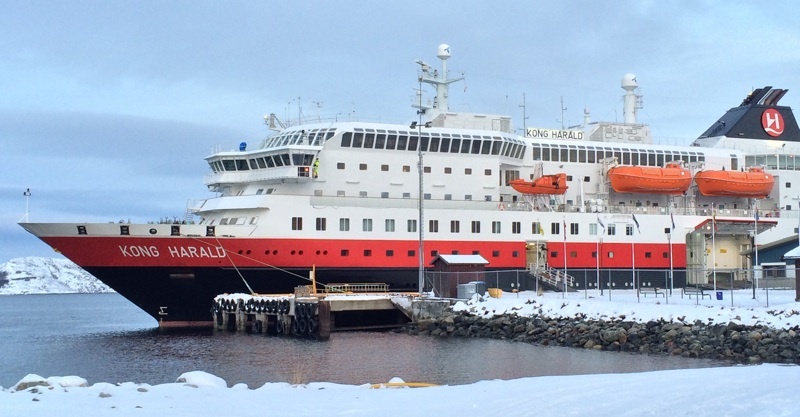 While it may seem somewhat contradictory for a cruise ship boss to be calling for stricter regulation, Hurtigruten is in the process of investing huge sums to upgrade its fleet to run on LNG and battery power. 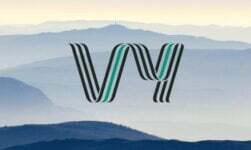 The company is most famous for its daily ferry service that sails from Bergen to Kirkenes and back, via a vast range of tourist destinations and small communities. While it started life as (and remains) an important transport link for these remote communities, the route is increasingly marketed as an informal cruise. Skjeldam said that his ultimate goal is for cruise tourism in Norway to be year-round but with the focus on having fewer passengers per ship who are willing to pay more for a quality experience in Norway. “It’s amazing that ships that sail along the coast use heavily polluting heavy oil as fuel in 2018. 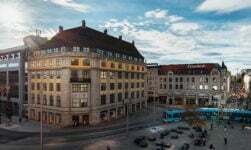 It gives greater emissions to the atmosphere, which increases with the risk of catastrophic emissions to the sea in the event of accidents,” he said to Dagbladet. The over-tourism problem is evident whenever you visit somewhere like Flåm or Geiranger, tiny villages that get swamped with hundreds or thousands of people for a couple of hours every day during the summer months. But the problem isn't just about people. It is getting more difficult to provide adequate shore power to visiting vessels. Many of the most popular destinations are extremely small, and struggle to provide enough energy for large cruise ships. Earlier in the year, Norway's maritime authorities proposed a zero-emissions zone covering the Norwegian fjords, which would mean large cruise ships would be unable to sail the famous fjords – at least with their current technology. However, Skjeldam is pushing for even tougher regulations for all ships larger than 10,000 tons. The high vessel traffic and high air pollution is increasingly becoming a health hazard for the local communities who live in the fjord region. Despite the tiny size of Geiranger, a 2006 study showed that its air quality was on-par with some major European cities. The number of vessels visiting the village has increased significantly since the study. The Norwegian fjords are quickly turning into a global study for the future of the shipping industry. 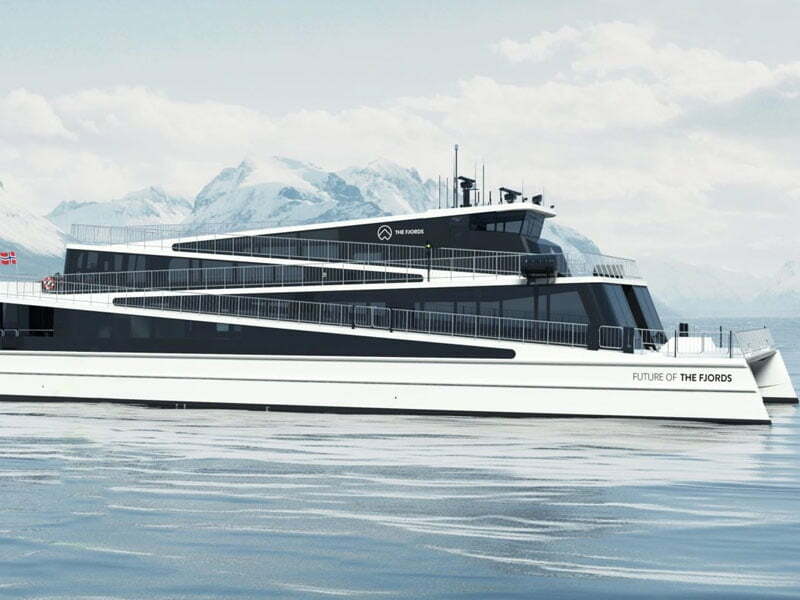 In 2016, the diesel-electric hybrid Vision of the Fjords was launched on the Norwegian fjords, and now the all-electric Future of the Fjords is in operation. 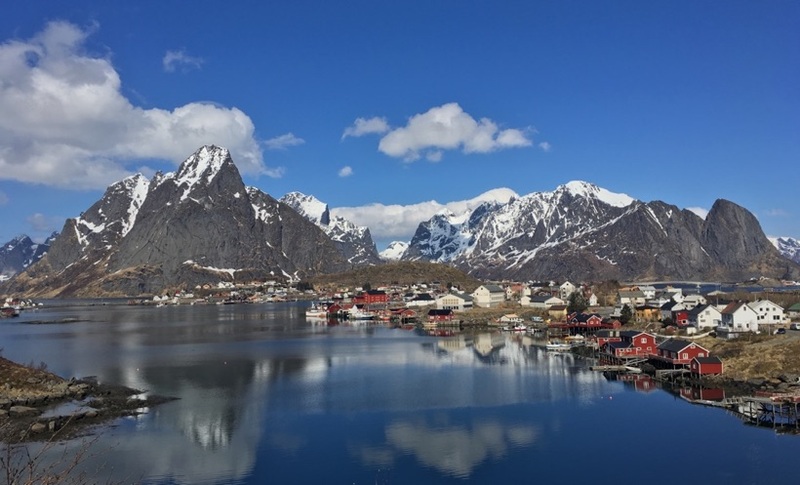 Skjeldam also shared his concerns that the increasing number of cruise vessels heading to Svalbard are increasing the potential for a major problem. If such a large ship got into trouble in a remote area like Svalbard, a rescue operation for thousands of people would be very difficult. Pointing towards Antarctica as a model, Skjeldam wants authorities and the industry to jointly develop guidelines for the remote, scenic and environmentally vulnerable regions of Norway. “The cruise industry has far too much control over itself. 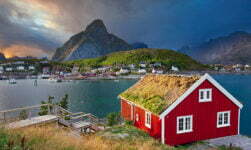 Now Norway has to take action to limit the damage and ensure a sustainable Norwegian tourism industry,” he said. I agree completely with Hurtigruten. Seeing those huge ships in such narrow fjords and the damage they can create is upsetting. Not only do they take away from the beauty of the sea, but the pollution from them is certainly a severe problem and think what folks throw in the waters as they lean over the railing to dispose of items rather than return to their rooms and properly dispose them. Having sailed on the coastal voyage round trip five times and knowing the beauty that is there before me, I might hesitate to even consider such a voyage again knowing of these large ships. There was one docked at Honningsvag in June2017 and filled the harborside. NOT MY INTEREST IN CRUISING IN MONSTER SHIPS!! Whilst staying in a house we rented on the hillside overlooking the Olden cruise ship berthing facility, this September, we observed the intrusive effects of a certain type of ‘mass people carrier’. The tranquility of the small village was changed by the arrival of the AIDAbella ( passenger capacity 2,500 ), and the resultant fleets of sightseeing coaches and ‘Noddy Trains’ which arrived to cater to the needs of the hordes who disembarked. The most offensive part of this ‘invasion’ as far as we were concerned, (and perhaps indicative of the cruise ship operators’ attitude (or lack of) to places they deign to visit), was when the ship prepared to leave the village. 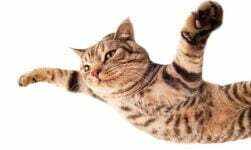 The song “Sail Away” was broadcast over the ships sound system for a full five minutes at incredibly loud volume which could be heard inside our house, and indeed several kilometres away. This was interspersed with various ‘announcements’, and could not have been final warnings to passengers to get back on the boat, as all boarding ramps had been removed some time earlier. Talking to locals I got the impression that these visits were not welcome, and they gave only limited financial benefits to the operators of the coaches etc, and the owners of the somewhat tacky souvenir shops. Hundreds of ‘visitors’ wandering around their residential areas, and taking pictures of the natives in their gardens was not totally appreciated. 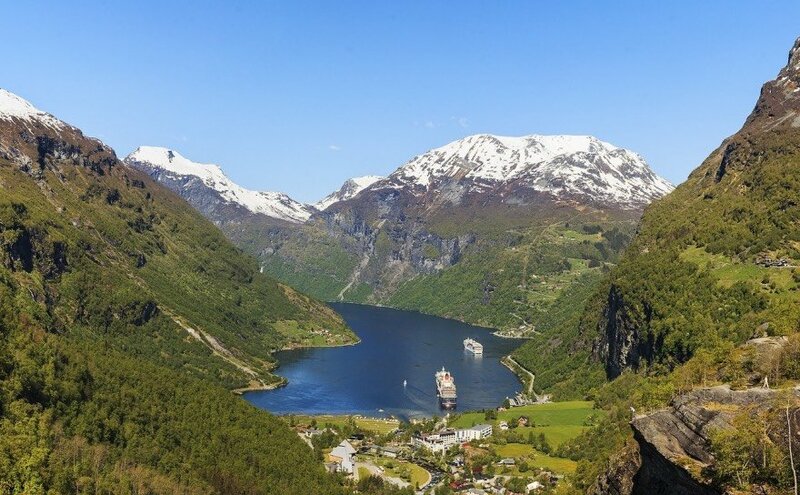 We avoid scenic places like Geiranger (we have cruiseship docking timetables) when ships are visiting (one day in July they had 9,000 + potential disembarkees ), and the chaos caused on the narrow, single-track mountain roads by the hordes of tour buses is considerable. The fact that these buses stop in ‘awkward’ locations to allow everybody off to take photos is another cause for concern – Trollstigen being being notorious for this. Much tighter regulation of these invasive incursions is long overdue. I visited Bergen in September 2018 after last being there in 1966. I was saddened by the changes although realise change must happen and my memories of this lovely city will be of 1966 rather than 2018. I suppose that is inevitable that tourism impacts negatively as well as positively but I will not visit again. The two places I remember with great affection in 1966 were Trollhaugen and the genuinely working fish market as well as Mount Floyen. The number of cruise ship passengers was, for me, overwhelming and I suspect this is happening all the way up the coast. It was a mistake by me in 1966 not to take the coastal voyage in one of the small ships but I was poor in those days. However the people have the same generosity, kindness and openness that has always been there. I at least was there on their National Day this time and that day WAS overwhelming Norway. I wish them well.